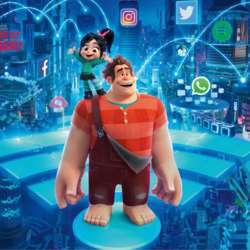 Ralph Breaks the Internet (originally titled as Ralph Breaks the Internet: Wreck-It Ralph 2) is a Protected content 3D computer-animated comedy film produced by Walt Disney Animation Studios and distributed by Walt Disney Pictures. It is the sequel to the Protected content Wreck-It Ralph about an arcade game villain who wants a role reversal, making it Disney's 57th feature-length animated film. The film was directed by Rich Moore and Phil Johnston (who wrote the screenplay with Pamela Ribon), and executive-produced by John Lasseter, Chris Williams, and Jennifer Lee. [a] It features voicework by John C. Reilly, Sarah Silverman, Jack McBrayer, Jane Lynch, and Ed O'Neill (reprising their roles from the first film), with Alan Tudyk returning to voice a new character, and new additions to the cast that include Gal Gadot, Taraji P. Henson and Alfred Molina. The film was nominated for Best Animated Feature at the 91st Academy Awards, 76th Golden Globe Awards and 24th Critics' Choice Awards. The movie will be shown in the original English version.